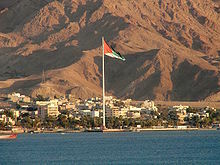 The United Arab Republic was a sovereign state in the Middle East from 1958 to 1971. It was initially a political union between Egypt and Syria from 1958 until Syria seceded from the union after the 1961 Syrian coup d'état, leaving a rump state. Egypt continued to be known officially as the United Arab Republic until 1971. Gamal Abdel Nasser Hussein was the second President of Egypt, serving from 1954 until his death in 1970. 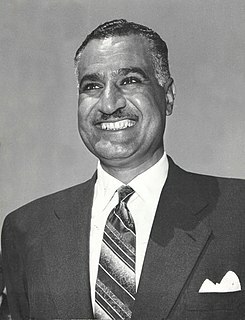 Nasser led the 1952 overthrow of the monarchy and introduced far-reaching land reforms the following year. Following a 1954 attempt on his life by a Muslim Brotherhood member, he cracked down on the organization, put President Mohamed Naguib under house arrest and assumed executive office. He was formally elected president in June 1956. Faisal I bin Hussein bin Ali al-Hashemi was King of the Arab Kingdom of Syria or Greater Syria in 1920, and was King of Iraq from 23 August 1921 to 1933. He was the third son of Hussein bin Ali, the Grand Sharif of Mecca, who had proclaimed himself King of the Arab lands in October 1916. Muhammad 'Izzat Darwaza was a Palestinian politician, historian, and educator from Nablus. Early in his career, he worked as an Ottoman bureaucrat in Palestine and Lebanon. Darwaza had long been a sympathizer of Arab nationalism and became an activist of that cause following the Arab Revolt against the Ottoman Empire in 1916, joining the nationalist al-Fatat society. As such, he campaigned for the union of Greater Syria and vehemently opposed Zionism and foreign mandates in Arab lands. From 1922 to 1927, he served as an educator and as the principal at the an-Najah National School where he implemented a pro-Arab nationalist educational system, promoting the ideas of Arab independence and unity. Darwaza's particular brand of Arab nationalism was influenced by Islam and his beliefs in Arab unity and the oneness of Arabic culture. The Arab Congress of 1913 met in a hall of the French Geographical Society at 184 Boulevard Saint-Germain, Paris from June 18–23 in Paris to discuss reforms to grant the Arabs living under the Ottoman Empire more autonomy. The Arab National Congress, was established by 25 official Arab Nationalists delegates to discuss desired reforms to grant Arabs more autonomy under the Ottoman Empire. It took place at a time of uncertainty and change in the Ottoman Empire: in the years leading up to World War I, the Empire had undergone a revolution (1908) and a coup (1913) by the Young Turks, and had been defeated in two wars against Italy and the Balkan states. The Arabs were agitating for more rights under the fading empire and early glimmers of Arab nationalism were emerging. A number of dissenting and reform-oriented groups formed in Greater Syria, Palestine, Constantinople, and Egypt. Under Zionist influence, Jewish immigration to Palestine was increasing, and England and France were expressing interest in the region, competing for spheres of influence.